Industrial production in the U.S. gained in February for the first time in three months, the Federal Reserve reported. Noting that American manufacturing may be returning back to more normal growth patterns after extreme blows from winter weather, the Fed also said capacity utilization expanded for the first time since November. 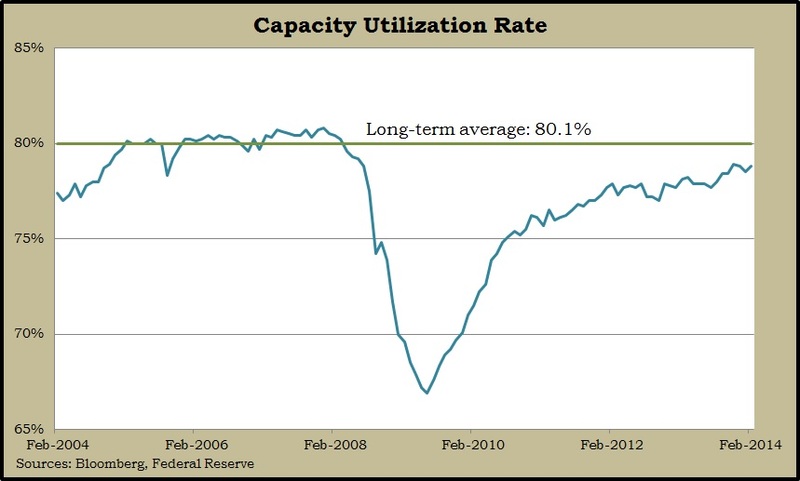 The capacity level stayed below the long-term average of 80.1%, at which point inflation is considered more imminent. The housing recovery, also affected by the weather, showed more signs of choppy progress in February with the pace of new housing construction dipping slightly. Single-family housing starts increased from January but fell more than 10% off from the February 2013 pace, according to the Commerce Department. A higher-than-expected boost in building permit applications was led by multi-family units. Inflation remained subdued in February with higher prices for food offset by lower gasoline costs, the Bureau of Labor Statistics reported in its Consumer Price Index. The year-to-year inflation rate reached 1.6%, excluding volatile food and energy prices. That’s below the Fed target of 2% and well under the 30-year average rate of 2.9%. The annual sales rate of existing houses declined in February for the sixth time in seven months, sinking to the lowest level since July 2012. The National Association of Realtors blamed slower sales on rising prices and severe weather, along with constrained inventory, although fewer sales helped raise supply slightly in recent months. The median sales price rose 9.1% from February 2013. The moving four-week average for initial unemployment claims declined for the third week in a row, dropping to its lowest point since November. The Labor Department reported data showing average claims have stayed below the 47-year average for more than 60 weeks in a row, a sign that employers are reluctant to lay off workers. The Conference Board’s index for leading economic indicators rose more than analysts expected in February. Economists for the business research group said economic drag from extraordinary weather appears to be temporary and the economy should keep growing at least into the second half of 2014. They identified wage constraints and consumer demand as chief challenges to the pace of expansion.